The best kinds of cliffhanger don’t actually leave the hero hanging on a cliff. They actually change the tone of the story you’ve been reading. It’s more like you realize that the protagonist has been hanging from a cliff for a while, and he (or she) just didn’t know it. 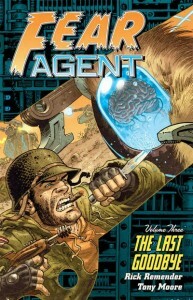 This was the kind of cliffhanger that Volume #2 ended with. Volume #1 was more of the hanging on a cliff kind. Although the artist is different in Vol. 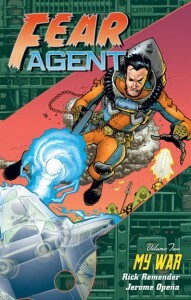 2 than in Volumes 1 and 3, Jerome Opeña does a great job of picking up where Tony Moore left off, and the style is so true to the way Moore started it that I honestly didn’t even notice. 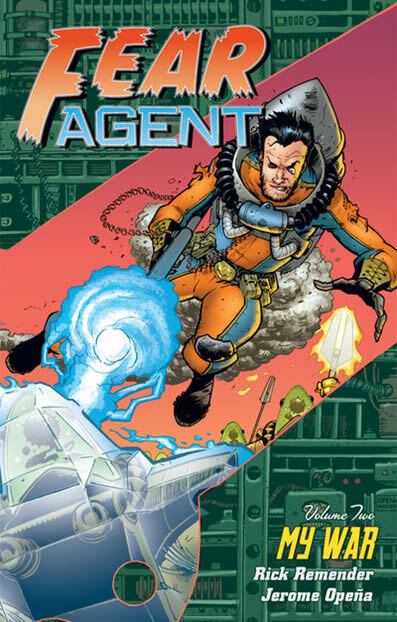 Fear Agent continues to make us love and hate the main character (Heath Huston) in equal parts. He makes incredibly stupid mistakes, and thinks a bit too much of himself (and only himself) for my tastes. He’s also completely a hick, and mostly dumb as a pile of rocks. Still, it’s all quite fun watching his life (and planet!) fall apart around him. And you get to blame it on aliens! I’m happy to report that, in spite of yet more “want to read more” type frustration, there is continued happiness and enjoyment. (The Clemens quotes also kick the series up a notch in my book.) I’ll report back when I’ve read the rest of the series. This entry was posted by Martin	on Saturday, August 23rd, 2008 at 10:29 pm and is filed under Dark Horse, TPBs/graphic novels. You can follow any responses to this entry through the RSS 2.0 feed. You can leave a response, or trackback from your own site.